From Thai Cooking by Josephine Brennan. This recipe comes from the Isan Restaurant in Udon, in its original form raw buffalo meat and blood are used. Since most supermarkets don’t have a “water buffalo” section I have suggested a common cut of beef steak. In small dry frying pan, parch the rice and chiles until the grains are brown and the chiles darkened. Remove the rice and chiles to a mortar or grinder and pound or grind until you have the consistency of coarse sand. 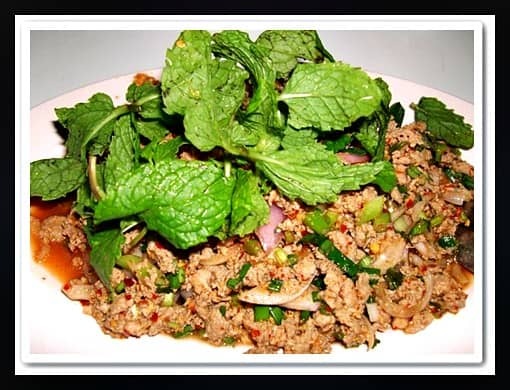 Place the minced steak in a bowl and mix with your hands, adding the ground rice and chiles, lime juice, lemon grass, red onion and green pepper. Chop half of the mint leaves and stir them into the mixture, reserving the remaining mint for garnish. Season this mixture with fish sauce and transfer to a serving dish. Mound attractively, and garnish with mint.